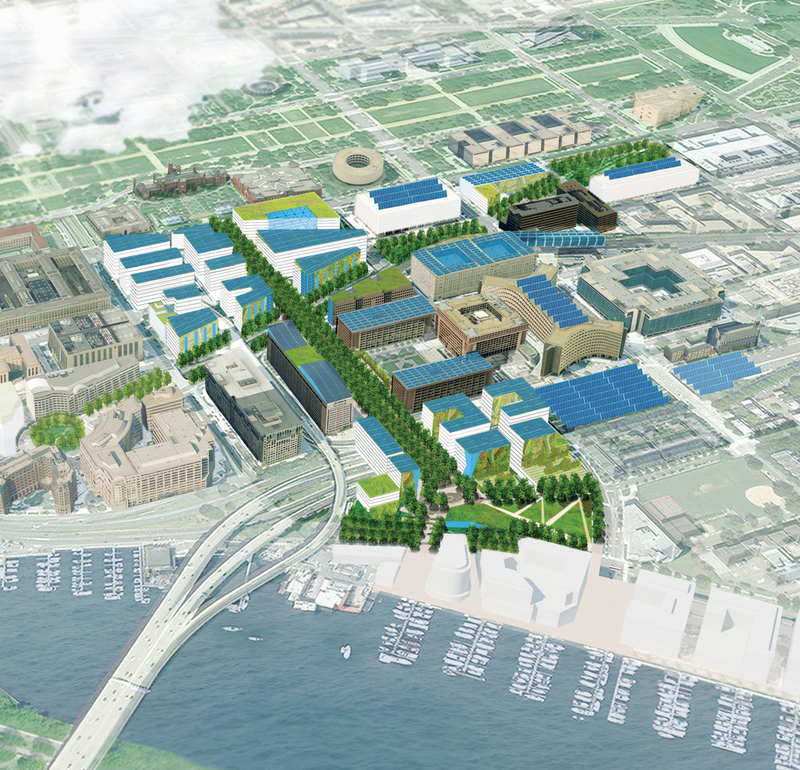 On July 19, the National Capital Planning Commission will hold a meeting to discuss the Draft Southwest Ecodistrict Plan, which has been in the planning stages for the past few years. The last public meeting was held back in July 2011 where three development scenarios were discussed. The Mission Statement of the SW Ecodistrict is as follows: Establish an Ecodistrict that transforms the 10th Street and Maryland Avenue corridors into a vibrant well connected place to commemorate, visit, work, and live in a matter that creates a national showcase of sustainability through innovation, technology, and design. The July 19th meeting will be held from 6:30 - 8:30pm at 1100 4th Street, 2nd Floor Conference Room. The plan will be released online starting on July 12 and public comments will be accepted until September 10th. RSVP for the meeting here. The Maryland Avenue Small Area Plan, which was conducted by the District Office of Planning and is a component of the SW Ecodistrict, was approved by the DC Council last month. 1) Restoration of the L’Enfant grid wherever possible, particularly including the removal of the Forrestal (Department of Energy) buildings for the restoration of Virginia Avenue, S.W., and unblocking the view of the iconic Smithsonian castle structure from 10th Street, S.W. 2) Preservation of the Banneker/10th Street Overlook in its entirety, including the Daniel Urban Kiley-designed lawns to Maine Avenue, S.W., and Ninth Street, S.W. 3) Evaluation of the I-395 decking to include as great a distance east of Seventh Street, S.W., as the gradient will allow, supporting both the L’Enfant grid restoration and the District’s (Legacy) Plan to deck the I-395 and tunnel the I-295 freeways. 4) Incorporation of a southern-facing entrance the L’Enfant Plaza Metro station. 5) Incorporation of southern access points into the L’Enfant Plaza retail center.